They’re the stylish new kids on the small SUV block, bringing a touch of flair and prestige to a segment already brimming with alternatives – 37 models to be exact, with an astonishing 182 variants. Standing out from the crowd is not only difficult, but vital. BMW has done its utmost to fulfil this brief with its all-new X2, an altogether funkier, more youth-focused small SUV that straddles the bridge between its X1 and X3 models. Jaguar, too, has tried to capture a piece of this lucrative pie with its all-new E-Pace, the ‘honey-I-shrunk-the-car’ sibling to the brand’s larger F-PaceSUV. Both present an interesting take on the segment. For BMW, there’s little doubt the Bavarians have upped the funk factor, with styling cues straight out of the pages of, the admittedly fictitious, Millennial Monthlymagazine. Sharp edges, bold colours and vibrant interiors hint at an altogether more youthful approach by BMW. Jaguar, for its part, has, ahem, borrowed heavily from the style guide of its F-Pace. It looks, simply, like a smaller version of the company’s flagship SUV. No points for originality, then. But styling is subjective, of course. What I like, you may not, and vice versa. The real test is in how these two newcomers perform in their intended purpose, and whether they have enough chops to stand out in an already crowded small SUV segment. That’s why we’re pitting these two Euro rivals against each other in a battle of the newcomers. The BMW X2 range is mercifully short, with just three variants available in Australia – two front-wheel-drive petrol and just a single diesel-powered AWD model. Our test car is the 2018 BMW X2 sDrive20i with the M Sport X package that rolls out of the showroom for $55,900 plus on-road costs. Contrast that to the Jaguar E-Pace range, where 38 variants serve to bewilder and bemuse potential buyers. That’s enough to confound even the most battle-hardened amongst us. Taking it to the Bavarians is the 2018 Jaguar E-Pace S P250, which sports a sticker price of $57,600 (plus on-roads). A close battle then, certainly on starting price, with just $1700 separating the pair (in favour of the Bimmer), according to the glossy, colour brochure. But, start ticking some options boxes – and invariably you will want to personalise your urban funkabout SUV – and the price spread starts to, well, spread. BMW, for its part, has added around $8K worth of red ink to bring the as-tested price to $63,940, while Jaguar will pilfer your bank account to the tune of an extra $13,280, pushing the as-tested price to $70,880 (plus on-roads) and ballooning the price differential to almost $7K. Strike one for BMW, then. Before we dig through the options list, though, let’s look at what standard kit your hard-earned buys you. As befitting any BMW carrying an M Sport designation, the X2 rides on some nifty-looking 19-inch M Sport alloys finished in what the brochure calls ‘Orbit Grey’. The M theme continues inside with an M Sport leather steering wheel as well as M-branded door sills. Outside, the roof-mounted spoiler is part of the M Sport X Package, as are the Frozen Grey accents liberally sprinkled around the body of the X2. Inside, BMW’s iDrive infotainment system is its usual sleek and user-friendly self. A 6.5-inch touchscreen is standard, although the X2 we have on test features an 8.8-inch touchscreen as part of the $4000 optional Launch Package, which as well as the aforementioned screen adds a panoramic roof, head-up display, wireless phone charging, anti-dazzle interior and exterior mirrors, and Navigation Plus. Other X2 option highlights include that love-it-or-hate-it (I love it, FWIW) Magma Red Dakota leather interior, a snip at $1950, metallic paint ($1190), and adaptive suspension, which at $400 is also a snip. Jaguar, as is its modus operandi, has not been shy with the options. The, if we’re being honest, rather dull Borasco Grey paint adds $1370 and the 19-inch alloys the E-Pace rides on will set you back another $1370. Keyless entry? That’ll be $950, thanks, while the interactive driver display asks for $690. The front pews are electrically adjustable – and heated – but they’re not free, with Jaguar wanting an extra $660. Smartphone integration is a further $420, which, in this day and age, is an insult. Still, BMW is equally as insulting by charging $479 for Apple CarPlay, although in our tester it came as part of the optional Launch Package. Both manufacturers are being a bit cheeky, then. And then there’s the Enhancement Specification Pack, a $3610 option that adds twin tailpipes, configurable dynamics, a powered tailgate, soft-grain leather steering wheel and a head-up display. And the cabin ambience is lifted to the tune of $2160 by a panoramic sunroof. Of course, if you opt for a standard E-Pace with no options (yeah, right! ), you’ll still find plenty of standard inclusions like cruise control with speed limiter (although not adaptive), the same as the X2. The Jaguar scores points for having lane-keep assist, while X2 owners will have to stay a little more alert with only lane-departure warning at their disposal. The Jaguar actually trounces the X2 on the safety front, with emergency braking, rear cross-traffic alert, 360-degree park aid and park assist all standard. The BMW does feature emergency braking assist, if not full autonomous emergency braking. Simply, it starts the braking process for you if it senses an imminent collision. BMW’s X2 wears a five-star ANCAP score, but it should be noted this was awarded in 2015 to its stablemate, the BMW X1, with which it shares its underpinnings. It might be a different story today. The E-Pace, for its part, also wears a five-star ANCAP score awarded in 2017. BMW has certainly tried to shake up the funkiness factor in the small SUV segment. And apart from its sharp exterior styling, the interior of the X2, and in particular this example with its lairy Magma Red leather interior, oozes fun. That red will no doubt polarise opinion, but it is, to my eyes, a welcome change from the usual grey, black and tan interiors so often prevalent. It certainly works with the black exterior, although we’d personally opt for one of the brighter exterior colours such as Galvanic Gold or Sunset Orange, both $1190 options, with the caveat we’d pocket the $1950 saving on that red interior and plump for the standard cloth and Alcantara trim with contrasting stitching. Whatever the trim, the seats are supportive and comfortable too, and you hunker down much like you would in a hatchback. There are enough M Sport elements to add an air of sportiness, and the usual BMW levels of user-friendliness married to tactility are evident. That sharp styling continues externally, the X2 every bit the svelte looker. From its sloping roofline and upside-down kidney grille, to the BMW roundels on the C-pillars, there’s no doubting the X2’s young-at-heart credentials. It’s certainly sleeker than either its X1 or X3 siblings – almost like a jacked-up hatchback, which in essence this small SUV is. Sleek and svelte are not two adjectives easily applied to the Jaguar E-Pace. And it starts with the kerb weight, a not exactly spritely 1832kg. That’s some 400-odd-kilos heavier than the X2, thanks to the E-Pace’s steel underpinnings borrowed from Land Rover stablemates, Evoque and Discovery Sport. Styling-wise, it’s no secret the E-Pace has borrowed heavily from its larger F-Pace sibling. It looks like a shrunken-down version from just about any angle. And that’s no bad thing – the F-Pace is a stylish take on the mid-sized SUV segment. But, and it’s a subjective but, where this particular example of the E-Pace we have in the garage is let down is in an unimaginative colour combination. That optional grey paint is hardly the stuff of funkadelica, and when married to an all-black interior, this E-Pace just screams ‘drab’. Which is a shame. There are better combinations. Once inside, though, the E-Pace is a comfortable and sporty place to be thanks to its sloping dash. Gone, too, is the almost ubiquitous Jaguar/Land Rover rotary-dialler gear selector in favour of a more conventional lever. The materials seem premium enough, although a forensic inspection highlights that this SUV has been built to a price point. Still, it looks and feels like a Jaguar, and that’s no bad thing. A 10.0-inch integrated touchscreen anchors the E-Pace’s infotainment. It’s a decent system, too, although the wait time for re-pairing your phone via Bluetooth can be a bit frustrating. The $1270 optional Meridian sound system is a boon, though, with crisp sound that permeates the cabin. The Jaguar certainly trumps the BMW in the second row, with better leg room, head room and toe room than its German rival. It’s also more comfortable, the back pew hugging you firmly, whereas the X2 makes you feel like you’re sitting on it, the bench altogether flatter than the Jag’s and with less under-leg support. The X2 also misses out on a USB point in the back (the E-Pace has three), but it does have a single 12V outlet. Boot space is a win for the Jag with the back row in use (484L against the X2’s 470L), but the BMW trumps the Jag once the seats are folded with 1355L against the E-Pace’s rather paltry in comparison 1141L. The Jag does score a space-saver spare, while the X2 rides on run-flats. Overall, the BMW edges Jaguar’s E-Pace, certainly in terms of outright funk factor. The X2’s interior is more refined, too, with better build quality easily evident. Sure, the Jag scores practicality points, particularly for its back-row prowess, but the X2 has it in spades in terms of space. This pair of millennial movers share quite similar powertrains. Under the bonnet of the X2 lies a 2.0-litre turbo petrol unit with outputs of 141kW (at 6000rpm) and 280Nm (1350–4600rpm). A seven-speed double-clutch auto transmits that power to the front wheels and helps propel the BMW from 0–100km/h in a reasonably spritely 7.7 seconds. The Jaguar also features a 2.0-litre turbo petrol engine, which is sourced from the wider company’s Ingenium family. With outputs of 183kW (at 5500rpm) and 365Nm (between 1200–4500rpm), the Jag overpowers and out-torques the X2 by 42kW and 85Nm respectively. And it needs to, giving away (as previously mentioned) a 403kg weight advantage to the BMW. Still, with a nine-speed auto sending power to all four wheels, and despite that extra pork, the Jaguar hustles from 0–100km/h in 7.0 seconds flat. Yet, while the E-Pace may hold a power advantage, it’s the BMW X2 that actually feels the sportier of the pair. There’s an urgency from the X2 simply lacking in the Jag, which, let’s be honest, feels its near two-tonne heft on the road. Whereas the X2 feels light and nimble with a spritely take-off, the E-Pace underwhelms despite its faster sprint claim. The X2’s front-wheel-drive underpinnings matched to that seven-speed DCT makes for an engaging combination. There’s no lag at take-off, and torque steer? Forget it, you won’t find it. The DCT shuffles nicely through the gears with minimal fuss or lurchiness. Stab the throttle and there’s little hesitation from the transmission, as it shuffles down a gear or two to find the right amount of revs and torque to give you that burst of acceleration. The Jaguar’s nine-speed transmission displays no such finesse, at once laggy and indecisive. Around town, the E-Pace is almost too eager to find top gear at the expense of not just driver engagement, but performance too. Adding a bit of weight to the right foot results in the requisite down-changes, however, here the indecision continues as the E-Pace finds what it thinks is the right gear, only to change its mind and opt for a different one. It’s as lurchy as it is frustrating. The Jag does compensate for this out on the open road, however, where the baby cat is happy to purr along with minimal fuss, provided not too much is asked of it. And it’s here where those extra kilowatts shine, the E-Pace less stressed on the highway than its German rival. That’s not to say the X2 is overworked, it most certainly isn’t, but at freeway speeds the Jag is just working a little less for its supper. And it feels more relaxed for it. Both the BMW and Jaguar feature variable drive modes. For BMW, the choice is between Eco Pro (don’t bother! ), Comfort and Sport. Comfort is as comfort does, a blend of around-town smarts and lightness of touch making the X2 an easy car to drive in the thrust and grind of traffic. Ratchet up to Sport mode and the engine note takes on a (slightly) gruffer note while the DCT does a good job of holding on to revs. There’s a touch more heft to the steering, too, for added engagement. No such engagement for the Jag, however, with Dynamic mode offering little more than a slightly nosier engine but without the commensurate performance lift. The E-Pace simply remains the lazy, docile beast it is in Comfort mode with a doughy throttle, while that nine-speed continues its enigmatic method of gear selection. It’s just, well, dull. All is not lost for the E-Pace, though, its ride and handling an excellent example of comfort without numbing the feel through the wheel. The ride is supple, but never soft, providing enough feedback to leave you in no doubt as to what those 19-inch alloys are doing underneath you. The BMW benefits from the optional (a snip at $400) adaptive suspension, which does a decent job of isolating imperfections and bumps in Comfort mode. The ride does firm up in Sport mode, but not to uncomfortable levels. That firmness is also a boon when pushing a little harder, helping to keep the X2 flat and composed, whereas the E-Pace does tend to lean a little in corners. Neither BMW nor Jaguar are offering anything like an industry-leading warranty. The E-Pace is covered by the brand’s three-year/100,000km warranty with roadside assistance for that same period. BMW, for its part, offers a slightly more generous (on paper, at least) three-year/unlimited-kilometre warranty, but really, how many of these cars are likely to ever see more than 100,000km of action in their first three years? BMW matches Jaguar with three years’ roadside assistance. If we are being honest, both warranty offerings are starting to look a little low-rent when compared with other manufacturers’ surety. Fuel consumption provides a mixed bag. BMW claims a pretty ambitious return of 6.0L/100km on the combined cycle. Did we come close? Not on your life, our example returning a reading of 11.9L/100km over a week of mixed driving. To be fair, we probably enjoyed its perky drivetrain a little enthusiastically. Jaguar offers a more modest 7.7L/100km on the combined cycle, and while we didn’t match that number, we did see a figure of 8.9L/100km at the end of our week with the car. Respectable enough, then. On the servicing front, Jaguar’s healthy 26,000km/12-month service intervals mean you don’t have to be frugal with your kilometres over the course of a year. There’s a capped-price servicing plan, too, $1500 for five years and 130,000km. BMW offers a five-year/80,000km Service Inclusive Basic package that’ll set you back $1395 for the duration, and covers your annual vehicle checks, oil changes, all filters, spark plugs and labour costs for the duration. There’s no question both Jaguar and BMW are gunning for a certain type of buyer with their new takes on the small SUV segment. BMW, certainly, has let the design department loose, and left unshackled – the result unquestionably a stylish crossover with funky elements not found on other, more austere Bimmers. Jaguar has taken a different approach by looking to its larger F-Pace SUV for styling cues. With near unanimous praise for the looks of the F-Pace, it’s as if Jaguar has said to its design department, ‘take that, and make it smaller’. Does it work? Yes, and no. Certainly the combination we had in the CarAdvice garage failed to excite. Of course, styling is just one minor part of the equation, and a subjective one at that. Although, one could argue styling is near the top of the list of requirements for buyers of this type of car in this segment. Still, looks can only get you so far. Ultimately, a small Euro SUV with a price tag upwards of $60K needs to perform, and perform well. And using that criterion, the BMW X2 is in front of the Jaguar E-Pace – well in front. This despite giving away power and torque, not to mention claimed acceleration times, to its Brit rival. It’s simply a more rewarding drive experience, with a punchier drivetrain and better handling. The X2 also surpasses the E-Pace with its more refined interior. 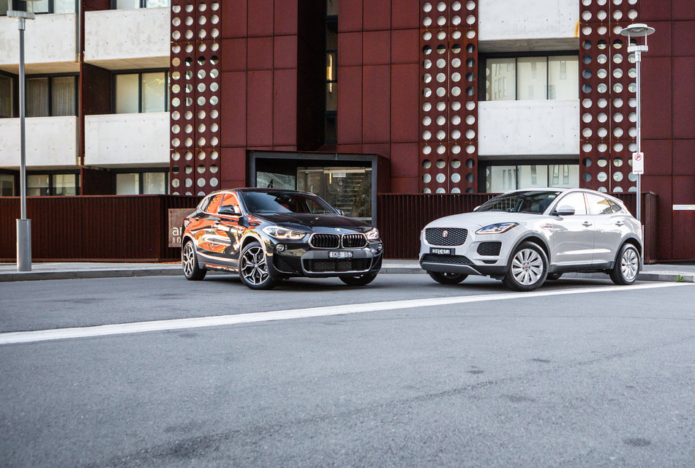 Simply, when looking at these two side-by-side, it’s easy to see BMW has been in the SUV game for decades, while Jaguar is just starting its journey. It’s a glaring difference, naked to the visible eye, and easily felt by the seat of your pants.